In modern times it has become very important that you dress yourself up properly in an interview because the first impression really does matter a lot. Even before you start speaking, you are presenting yourself through your clothes, shoes and accessories. If it seems that you haven’t taken enough time to prepare for this big day, then you are sure to give out a negative message to your interviewer. It won’t be wrong if they feel that the interview doesn’t hold any importance to you and that is the reason you are shabbily dressed. Following mentioned are dressing for interviews tips for male and female. It can be quite stressful to select the right color, right dress and the perfect accessories for your interview day. But you have to go through this ordeal if you need the job. Therefore get ready to hunt down the perfect dress for you which will not only make you look presentable but will also carry a professional attitude too. Sometimes it is easier to choose the correct attire that you are going to wear, but when it comes to color most people make a mess. Though the safe bet is either black or white, then also you can experiment with other colors too. There are some bold colors which really will work in your favor if you can carry it off. Therefore, start with grooming yourself and then dig in deep inside the colors so that it carries out the message that you want to convey to your interviewer. If you are thinking that you are going to appear in an interview and not in any fashion show so anything will work as long as it is neat and clean, then you are getting it absolutely wrong. Gone are the days when just about anything used to work, now you have to dress yourself up properly because everything carries points these days. Therefore, when you first step into the interview room, starting from your shoes to the way you have styled your hair everything gets noticed by the interviewer. 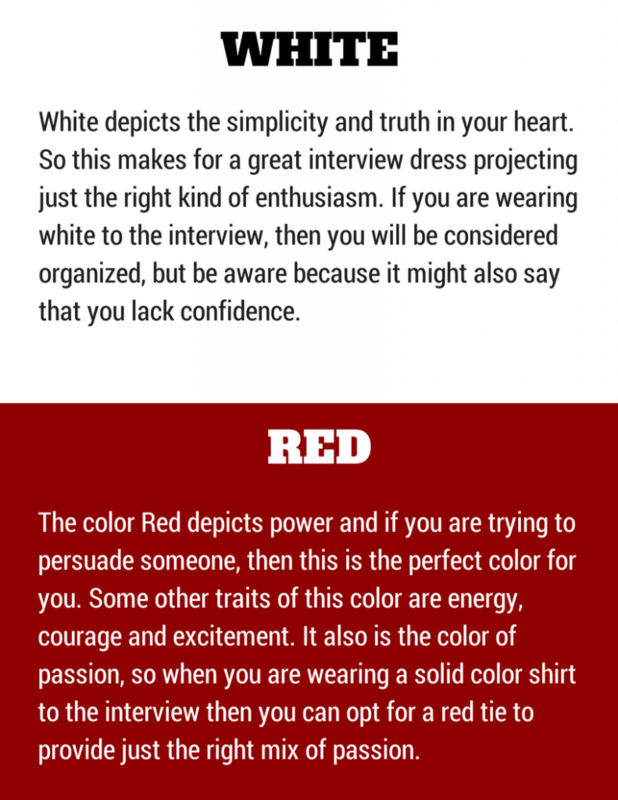 If you have selected the right color as per your personality, it will definitely impress the interviewer and then rest of the things will fall in place. Now you see a single move towards the selection of right color can tell so many things about you in only a glance. So what do you choose – solids or patterns? Which color will be the best for you when you are going for the interview? If you want to know the answers to all these questions then read on. 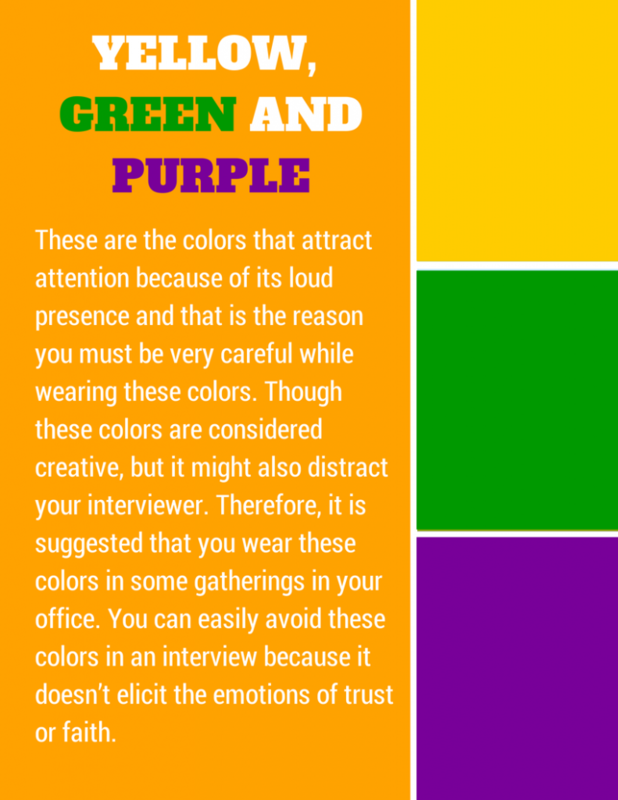 A survey by CareerBuilder came up with some interesting facts about how the interviewer’s associate colors with the candidate’s personality and what they feel is the best and the worst color to wear in an interview. 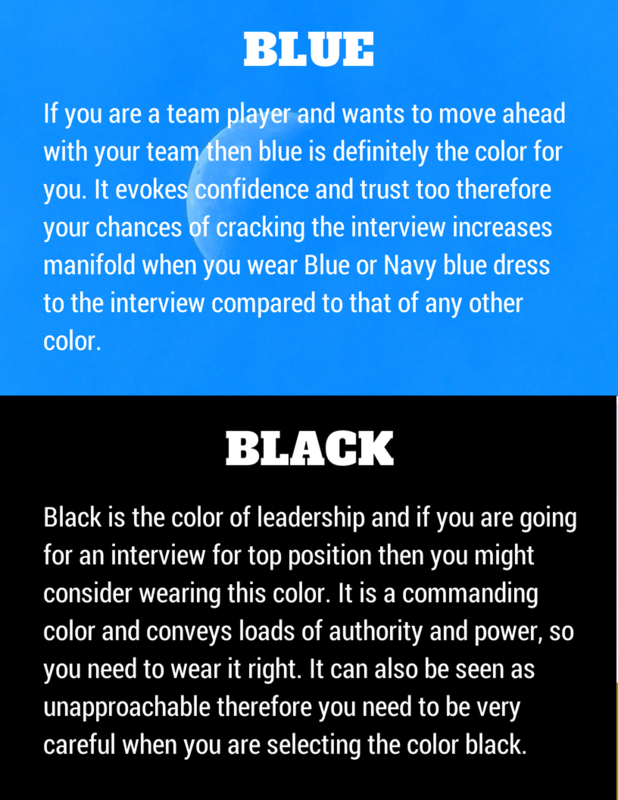 Blue topped the list of the best color to wear in an interview with 23% employers voting for this color followed by black which received 15% votes of the employers. 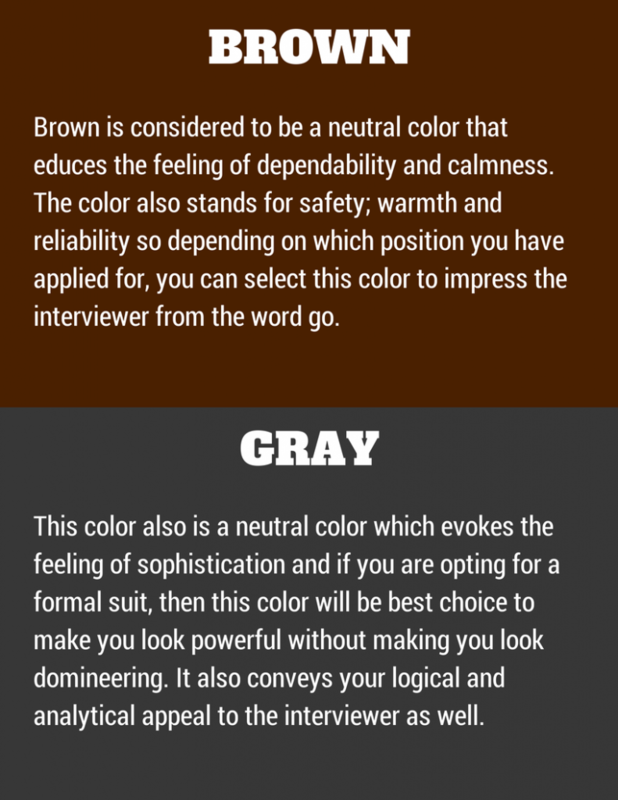 And if you want to know which color you should avoid while going for the interview then it is definitely orange though it is termed as the color which reflects creativity. Almost as many as 25% employers have voted against the color. Therefore, if you leave out orange than the other colors that you are left with are Gray, Brown, White and Red apart from Black and Blue. The color evokes emotions subconsciously in our mind. Therefore, when we look at certain colors or dress up in certain colors, then it either makes us feel all excited or calms us down. Here is a complete list of colors and what message they convey so that you find it easier to pick up just the right color for you. When you are going for an interview, then you must do your little research on the company first. 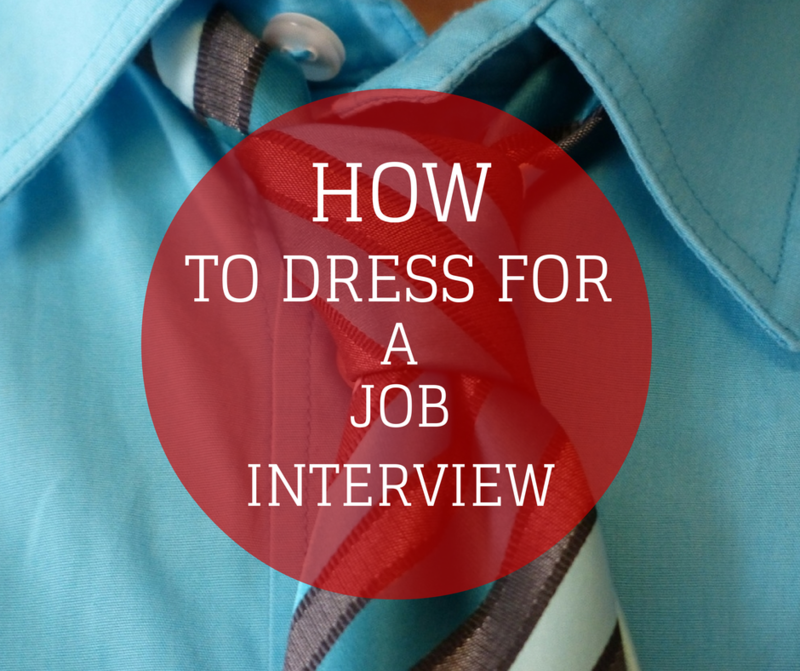 It will help you in the interview as well as in the dressing up for the interview. When you will know how the employees dress up generally in that office, then you would also love to dress up in the same way to make you look fit for the office environment. If the employees of the office stick to the conservative look, then you must not turn up wearing bold colors instead you must stick to the neutral colors only. 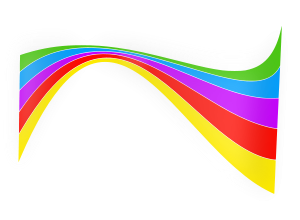 If you are going for some non – profit organizations then you can play with some colors because they are generally more casual in nature. But you must remember that it should not be too loud as it is just not acceptable anywhere. Only when you are going for a job in the fashion arena you can go for some creative colors, otherwise it is best to leave them out. So you see how important it is doing your research on the office environment so that you fit the bill perfectly from the very beginning. If you are in any kind of doubt or if you are not sure whether you will be able to carry off different colors or not, then you can go for the safe bet that is the color blue. Dress up according to the environment of the office without making any loud style statement or subdued style statement. Both will hamper the possibility of you getting selected in the interview. Even when you see people moving around in casuals in the office when you are going for the interview you must not be too casual and not too formal as well. Opt for something which is semi – formal. When indecisive, it is best to stick with neutral colors like Brown, Blue or Gray. You can never go wrong with these colors. Try out the outfit once before the interview so that you know that it is neither too loose nor too tight for you. Your outfit must not make you look ugly instead it must suit you perfectly and enhance your look. The interviewer might get distracted by the big loops that you are wearing or the big flashy wristband. Therefore, it is best if you keep your accessories to the minimum. A watch is perfect, but don’t go for colorful ties or other loud accessories. When you are selecting a color for your outfit make sure that it suits your skin tone and don’t just wear a color because it is said that it will enhance the chances of you getting selected in the interview. The color must suit your personality and your skin tone. Women love their makeup but that doesn’t mean that you will wear heavy eye shadows, lipstick and eye liners, instead it is best to tone down. Just try and wear natural colors instead. Men should shave properly and do not come over for an interview with a two-day beard on their face. In case you are going to keep your stubble, then make sure you trim them properly. Ensure that your shoes are polished, the belt is correct and your clothes are properly ironed so that it doesn’t look all wrinkled up. Make sure you have your nails clipped properly and if required get a haircut so that your hair looks manageable and well kept. You never know whether your interviewer is allergic to some kind of smell or not, therefore it is better that you avoid wearing perfumes or even after shaves. Though these are some of the important points that you must remember while you are going for an interview, this would never replace your real knowledge. In order to get through an interview, you will have to prepare well and make sure that you answer the questions that you have been asked. The colors and the attire that you wear to the interview will help you in making the first impression but nothing beyond that. If you want to get selected, then it has to be your talent, knowledge and your experience in the field. With the right choice of colors, you will be able to stand out in the crowd and make the interviewer understand your personality traits even before you open your mouth.